ROCO performs ROCOmoji at the Church of St. John the Divine. Photos by Morris Malakoff/CKP Group. Composer Alexander Miller performs ROCOmoji. 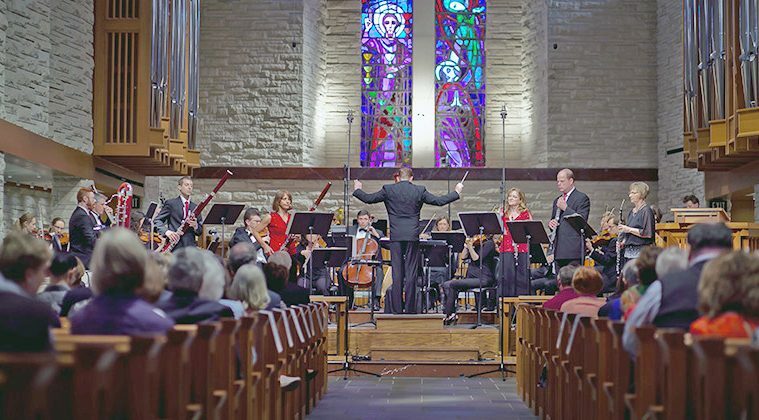 Savvy concert goers can count on ROCO (River Oaks Chamber Orchestra) to keep up with current cultural trends. 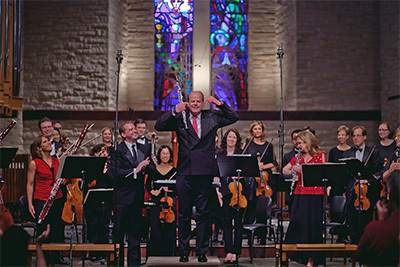 On its In Concert season finale Double Trouble, a new commission and world premiere took center stage, Alexander Miller’s ROCOmoji, a concerto grosso for double reed sextet, strings, harp and percussion, inspired by the fastest growing language in human history, the now ubiquitous emoji. Lately, emojis have been all over the news. The Unicode Consortium just announced the 69 new emojis set for release in June of 2017; MoMA recently acquired for their collection the original set of 176 emojis, first released in 1999 for the Japanese national carrier NTT DOCOMO; a Texas lawmaker filed an actual bill to stop people from using the Chilean flag emoji as a stand-in for the Lone Star State (perhaps we should apply to the Unicode Consortium for a Texas emoji); and Sony Pictures is getting in on the action with the release of The Emoji Movie this summer. Composer Alexander Miller’s Rocomoji comes at the perfect time, giving emojis serious, thoughtful treatment as they evolve from cute and at times frivolous symbols, to a 21st century language that has the capability of expressing human emotions in a direct, pictorial, and visceral way. 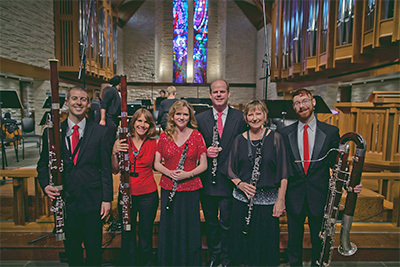 ROCO artistic director Alecia Lawyer and Miller were fellow oboists at Julliard in the 1990s, so she has first hand knowledge of Miller’s sharp intellect and wit. She asked him for a piece that would feature ROCO’s killer double reeds, and Miller delivered a brilliant concerto grosso for double reed sextet in 5 movements, with emojis in place of titles (😔😯😍🤑😡). 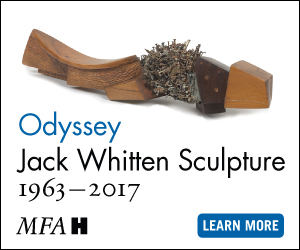 This was the highlight of a program that also included a radiant and pristine performance of Saverio Mercadante’s quasi-Mozartian flute concerto by ROCO flutist Brook Ferguson, and an inspired rendering of Arnold Schoenberg’s hyper-Romantic tone poem Transfigured Night. Nathan Koch, Kristin Wolfe Jensen, Alecia Lawyer, Alexander Miller, Spring Hill and Daniel Chrisman. I must admit, when I first heard the title ROCOmoji, the words that popped into my head were “cheesy and silly.” But it was immediately apparent that Miller intended to tell an important human story through his music. The impetus for this piece, revealed in the program notes, could not have been more serious–a friend who was dealing with severe depression had once sent the composer a text message with a single emoji 😔. The plaintive English horn solo that opens the first movement expressed this deep sense of loneliness. Miller’s writing expertly displays the virtuosic capabilities of the double reeds, as all 3 of the fast movements sparkled with irrepressible energy, buoyed by brilliant passage work, daring leaps, and complex rhythmic activity. ROCO encourages the audience to use the innovative Octava app in its concerts, and while I was skeptical of the distraction of looking at my phone during the performance, this proved useful and fun in following a new work. The audience giggled when the 😍 movement began on screen with “leave love to the oboe, my friends.” I was completely seduced by the gorgeous string and harp passages when love blossomed to full flower. The player and audience favorite, without a doubt, was the 🤑, as in “show me the money!” Imagine a play by play, set by rows of slot machines in the casino–”coins dropping, reels spinning, 3 more coins, 3 more, more reels, JACKPOT! Thinking about trying again, try again, watch the money go away.” The music was exactly that. You have to hear it to believe it. Miller’s writing is deliciously evocative, imaginative, and humorous. If these emojis are to represent of our real emotions, then Miller gave them a musical dimension with refreshing directness and sincerity. The story he told, a human cycle of loneliness, surprise, love, greediness, leading to the anger that brings us right back to loneliness, is wholly poignant and empathic. ROCO hit the jackpot with its 57th commissioned work.